Currently based at No8 Calthorpe Road, PKF Cooper Parry’s new office at Blythe Valley Park will provide a modern, aspirational environment, incorporating the latest business thinking on flexible workspace and employee wellbeing. Rob Hemus from IM Properties said the firm’s decision to move from a city centre location to the greener, more open spaces of Blythe not only reflects its forward thinking but is a growing trend from occupiers looking to set themselves apart to attract and retain the best staff. “We’ve always said Blythe is not your average nine to five. The location sits perfectly with occupiers’ desire to offer employees something a bit different, which isn’t all about the work. Set in a 122 acre country park, we’re geared up to looking after staff wellbeing with open spaces to get out and run, walk and cycle in. We’ve also got a Virgin Active gym on site and have recently invested in a coffee house, which opens Q1 2017 and will be run by leading Birmingham independent Java Lounge. Ade Cheatham, CEO of PKF Cooper Parry, said: “One Central Boulevard will provide us with modern, high specification, Grade A office facilities. Anyone who has visited our Sky View office in the East Midlands will know that we’re not your typical firm of accountants and like to do things differently. “The new West Midlands base has been designed to be flexible, to encourage creativity and collaborative working. It will be leading edge in design, with lots of quirky and fun features thrown in – from Narnia cupboards to Segways and a running track to ‘wow’ our staff and clients alike. PKF Cooper Parry is the fastest growing firm of accountants in the UK and the only accountancy firm listed in The Sunday Times’ 100 Best Small Companies to Work for. 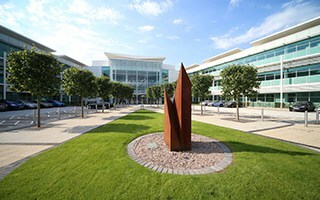 The firm joins existing tenants Siemens, Arup, Infor, Enzen and Zenith at Bythe Valley Park. Prologis and Rybrook have also both signed pre-let agreements for 15,000 sq ft of space. Ashley Hancox, executive director and national head of offices at CBRE in Birmingham, said: “Attracting a tenant with the vision and aspirations of PKF Cooper Parry is exactly what the letting team hoped for as we set out our ambitions for One Central Boulevard and future phases of Blythe Valley Park. As part of the approved plan, IM Properties will also look to add up to further 1 m sq feet of commercial space, which will potentially create up to 7300 new jobs in the area. Provision for a 200-bedroom hotel and a housing with care facility of up to 250 units, leisure and other uses of up to 40,000 sq ft is also included.